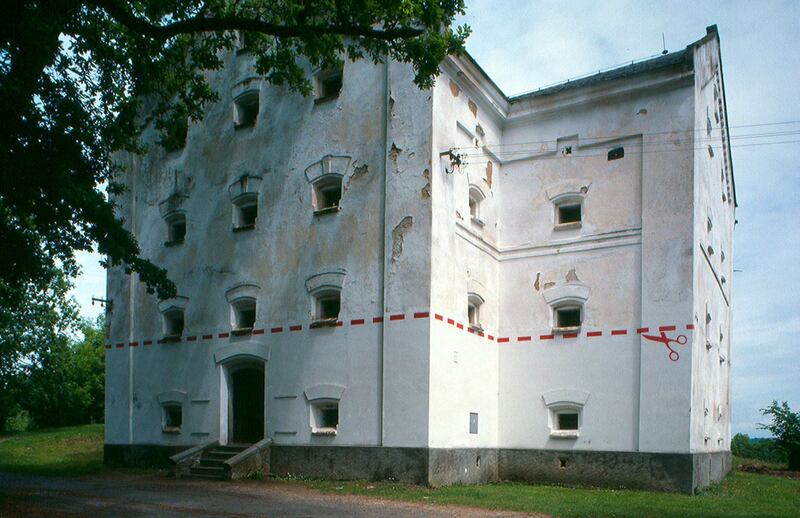 Painted on the façade of the baroque-era Czech granary, Red Trim juxtaposes the austerity and grandeur of the aging building with clip art, coupon-cutting scissors and dashed line (the very same scissors and line that often imply some kind of convenient financial “savings”). At some point in the life of the building, caretakers decided, curiously, to restucco only part of the façade, leaving the sides, back, and upper levels unrenovated. The cartoon-like scissors and dotted line draw attention to the division that presumably was intended to be overlooked, but now announce a humorous urgency to building’s need for restoration.